You may already know that, if one cat is asleep and one is awake, they will never be able to mate. However, if one cat is happy (over 75% happy) and one cat is not (under 75% happy) they will also not be able to produce a box. Both cats must be over 75% happiness at the same time in order to reproduce and make a box. The happiness of the cats runs on a cycle, depending on their energy level. Therefore, to get over this potential breeding problem and to maximise box production, it is important to synchronise their energy levels to be as close as possible. When a cat sleeps, its energy rises from 0% to 100%. When a cat is awake, its energy level falls from 100% to 0% again. Wait until the cat with the higher energy level is awake and the cat with the lower energy level is asleep. (If you spot a chance, you could wake one of them up to create this situation.) The cat that is awake will start to reduce its energy level and the cat that is sleeping will continue to increase its energy level. When both cats have identical values of energy (or are very close) wake up the sleeping cat and the synching is then complete. Just one word of warning (and an extra complexity) a cat must have over 25% energy in order to be able to be woken. This may need to be taken into account when doing this task. If the male and female are shared between two different owners, it might be easier if one owner has both cats in order to perform the synching – it can get rather complicated if not. That person can then pass the “other” cat back to the original owner after this is all completed. This may make the task a little easier to complete. When the cats have identical (or near identical) energy levels, their happiness levels will also be synchronised. This means that they will be at their optimum for breeding purposes and will produce a box at the most efficient rate. Many owners with be familiar with the principle of outcrossing or inbreeding to obtain a desired KittyCat look. 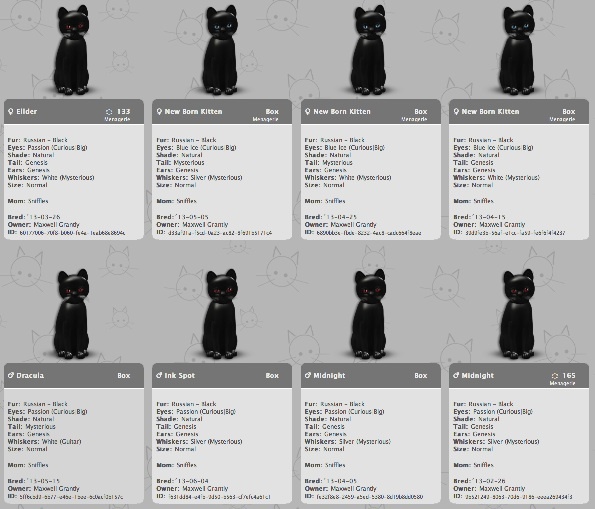 If you have browsed the various cat markets looking for a trait to add to your existing stock you have been outcrossing. This is when you introduce an unrelated cat to existing stock to get the desired result that you want. For example, to produce a Russian Black with passion eyes, my younger brother offered the use of Sniffles (a Bengal Snow with passion eyes) to mate with a cat of mine, Jet (a Russian Black with blue ice eyes) in order to achieve this breeding target. This is an example of outcrossing. However, if I had a sibling, parent or other close family member with the genes that I required, this would have been an example of inbreeding. Luckily for my brother and I, the majority of our offspring were passion-eyed Russian Blacks and so the pairing had produced exactly what we had wanted, many times over. However, there are times when the pairing of parents fails to give the result that is required. 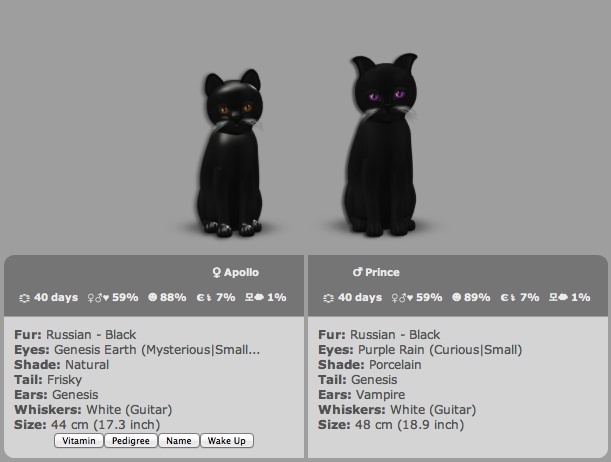 For example, look at the following combination of kittens that could be used in an attempt to get a Russian Black kitten, with purple rain eyes and vampire ears. 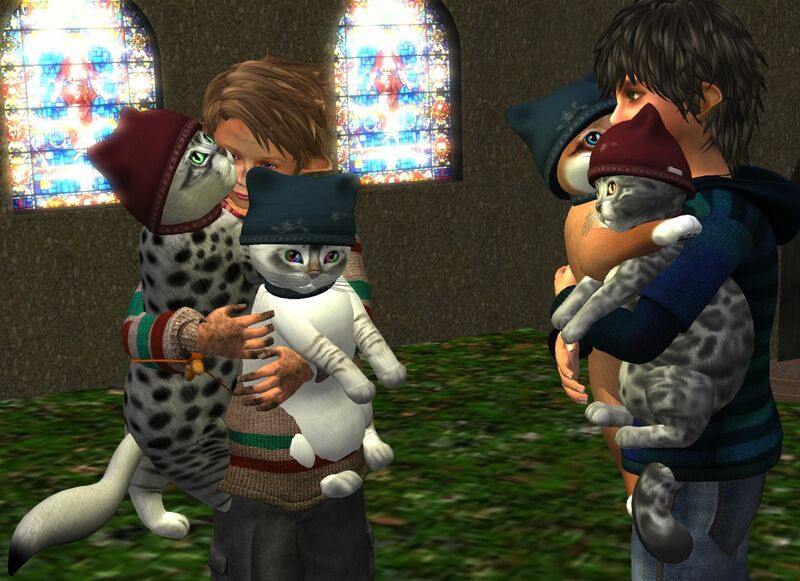 On first inspection you may think that, because all the desired traits are shown in abundance in both the parents, it would be an easy affair to simply leave the pair bonded together and then wait for them to produce the kitten that you wanted. However, the female (Apollo) has both highly dominant eyes and ears and, very importantly, she has a hidden ear shape of “curious” that is also more dominant than the vampire ear gene of her mate, Prince. This means that, when she breeds, there is a 50% chance of her passing her genesis ear and a 50% chance of passing her curious ear. The result being that, half of the offspring of this combination will have genesis ears and the other half will have curious ears. The goal of achieving a Russian Black with both purple rain eyes and vampire ears with this combination is impossible. This is where the strategy of back breeding comes into play. When two cats produce a box, you are moving forward with the generations. Back breeding is the name given to the method in breeding the offspring with one of the parents or grandparents (or even further back, if you so desire.) 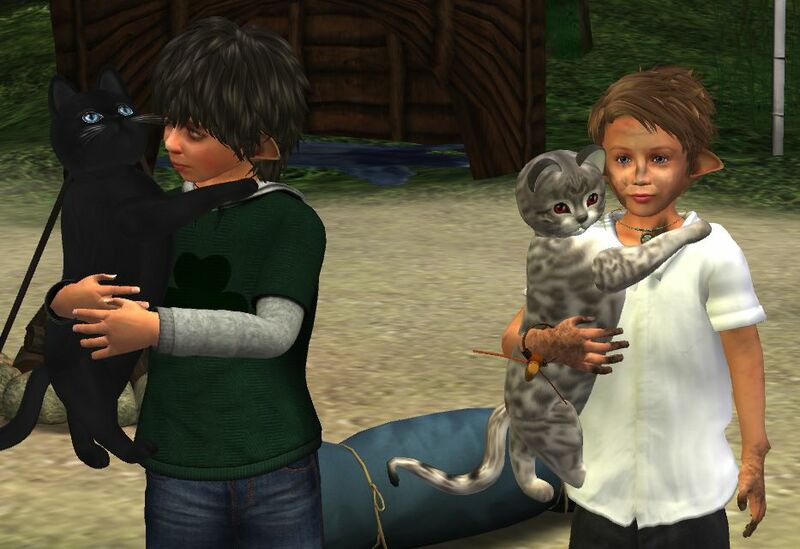 For the following example, I have used back breeding with parent/offspring pairings. Allow me to illustrate how back breeding works by considering one past project of my brother and myself: the creation of a passion-eyed, vampire-eared Russian Black. After obtaining the Russian Black kitten with passion eyes, as described above. 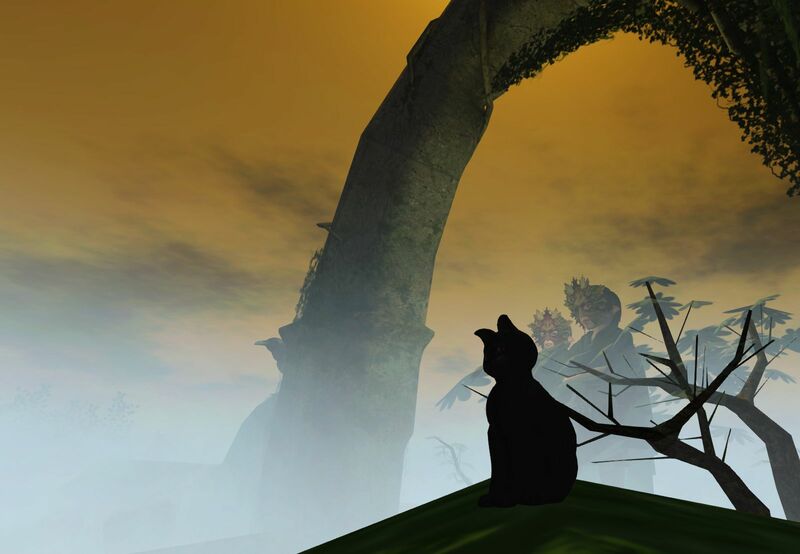 The new project of Skippy and I was to add vampire ears to the mix and create a perfect kitten for Hallowe’en. This project was to be harder than it may have first seem, simply because vampire ears are so recessive. One of the kittens produced by the original Sniffles and Jet was called Ellder. Ellder had the desired passion eyes and a Russian Black fur and so the next project was to add vampire ears to the mix. One suitable male called Fang was found to bond with her. 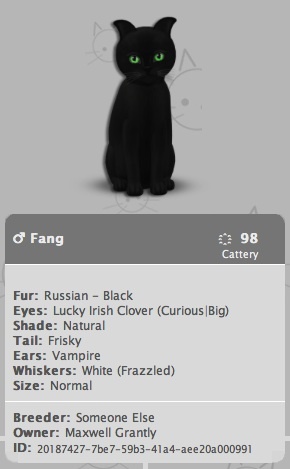 Fang had the same sombre Russian Black Fur with vampire ears but Lucky Irish clover eyes instead. On first inspection, he might seem the perfect father to produce a vampire-eared offspring. 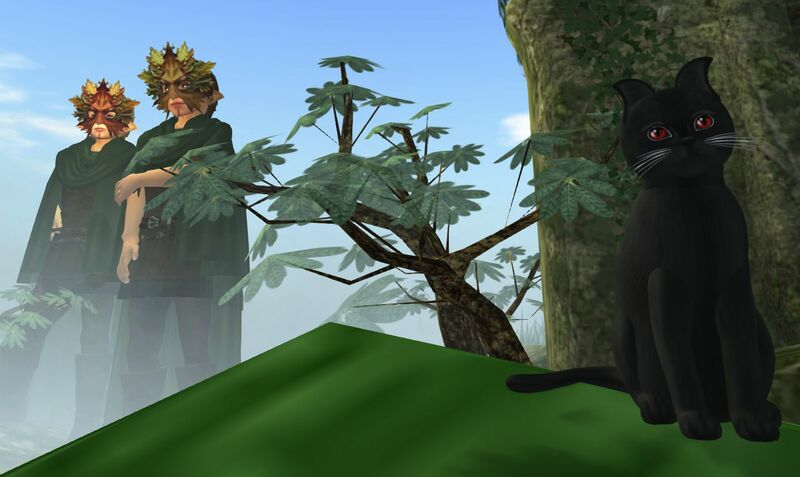 However, the problem was that both Ellder’s genes for ears (genesis, the shown, and curious, the hidden) were more dominant than both Fang’s vampire ear gene and his unknown hidden ear gene. This particular combination would never produce a vampire-eared offspring. But however, more importantly, it could be used to set up a paring that could. In every one of these four combinations, the genes for ear shape of Ellder were more dominant than the genes for ear shape of Fang and so half the offspring would have genesis ears and the other half of the offspring would have curious ears. However, this particular pairing had not been in vain. Despite the shown ear shape being either genesis or curious, all of these offspring now had a recessive gene introduced that had come from Fang, the father. This recessive gene may have been either vampire ears or (possibly) an unknown gene that was even more recessive. Now, it was irrelevant whether this daughter had either genesis ears or curious ears as shown, either had an equal chance of producing the desired outcomes. However, in this particular bonding, the daughter actually had genesis ears. She was named “Chancer” and looked very similar to her mother, with the exception that she carried the vampire ear gene as her recessive trait. Ellder was retired from her partnership with Fang and Chancer was substituted in her place. A daughter to mother back breeding substitution was used. In example one, the chance of gaining a vampire-eared kitten was now 50% and in example two the chance of gaining a vampire-eared kitten was 25%. Actually, in the Chancer and Fang pairing, Skippy and I were lucky and we managed to obtain “Example 1” so that our final kitten “The Vampire Kitten” was born very soon. However, if we had obtained “Example 2” the chances were that it would have been born a week or two later. 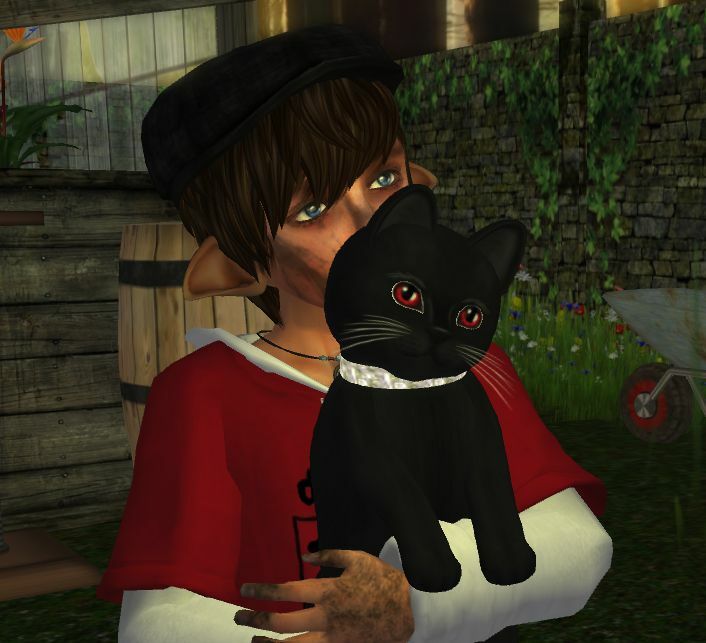 Most importantly, we had achieved our goal of breeding the cat that we wanted and we were the proud owners of our perfect Vampire kitten called “The Vampire Prince” well before our target date of Hallowe’en. Good luck with your breeding projects. Skippy and I hope that you have found these notes useful and we wish you well in your KittyCats projects.